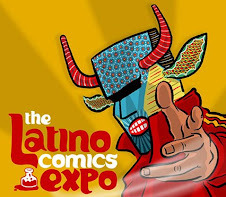 MANGA MUERTO, COMIC POP & WEAPON TEX-MEX comics back in stock with new printings! For those of you browsing my webshop here, you may have noticed that a few of my comics were out of stock. Well, they're back! 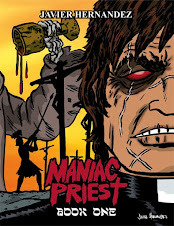 Yes, MANGA MUERTO Vol 1, COMIC POP! & WEAPON TEX-MEX Vs EL MUERTO are back with all-new printings, now now featuring cardstock covers, giving you a beefed-up book. AND, the prices are now actually lower than on the previous editions! I have a new printer I'm using, and their pricing is so good, I've been able to share the savings with new retail prices. If you're looking for stories for younger readers (grade school/middle school), then MANGA MUERTO Vol 1 is a great way to go. It features a more kid-friendly version of my comic book character El Muerto, here recast as a foreign exchange student in Japan who comes into possession of a giant mega robot, Skeletron! (Think GIGANTOR or JOHNNY SOKKO & HIS FLYING ROBOT, cause I sure was!) There are three stories in this jam-packed 48 page book, enough for a weekend of fun. Giant robots, towering monsters and thrills for fans of...well, giant monsters and towering robots! 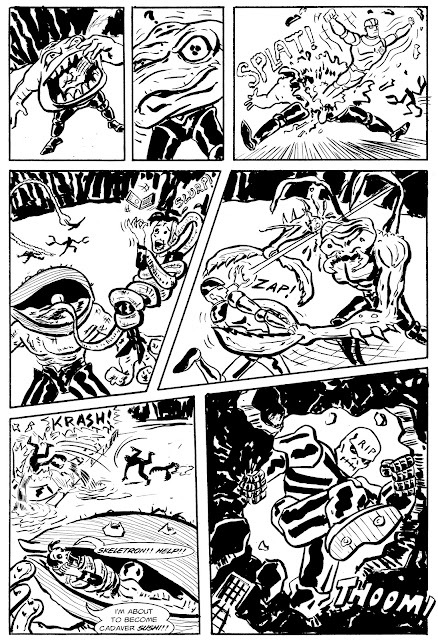 Shown here is a page from MUERTO & SKYMAN, the second story in the collection. Pencils by me, inks by Ted Seko. 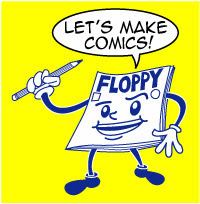 COMIC POP! features a cornucopia of work, such as pin-ups I've done for other publications, pin-ups other artists have done of my characters, stories I've written and drawn for other creators, comics I've collaborated on, etc. 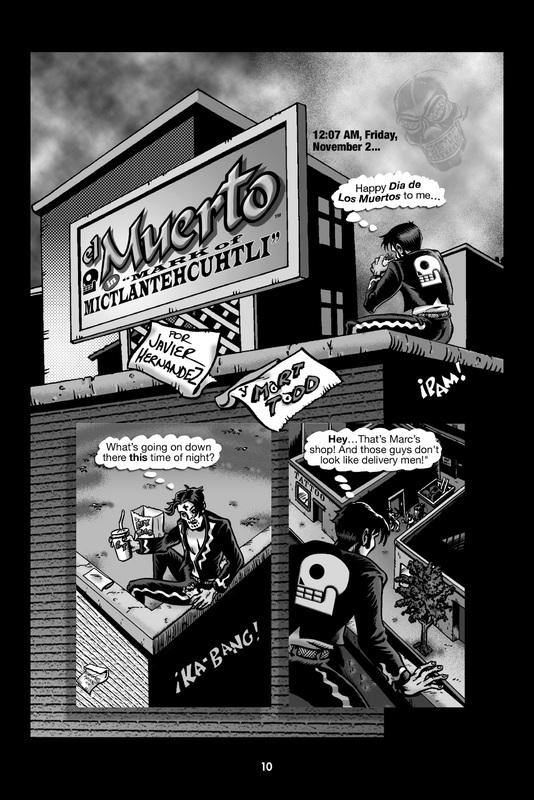 I even reprint, for the first time in a comic book format, El Muerto's multi-part appearance in the BALDO newspaper strip from 2008! At a 40 whopping pages, this book delivers plenty of art and story. From COMIC POP!, the El Muerto story originally included as a mini-comic inside the package of the EL MUERTO DVD release. Story and pencils by me, finished art by Mort Todd. 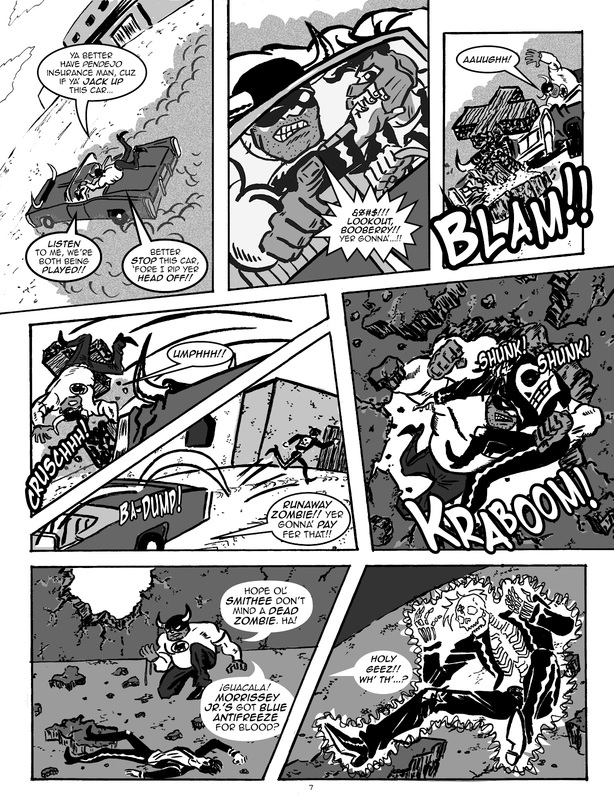 WEAPON TEX-MEX vs EL MUERTO brings together two of my characters in a classic superhero street brawl. 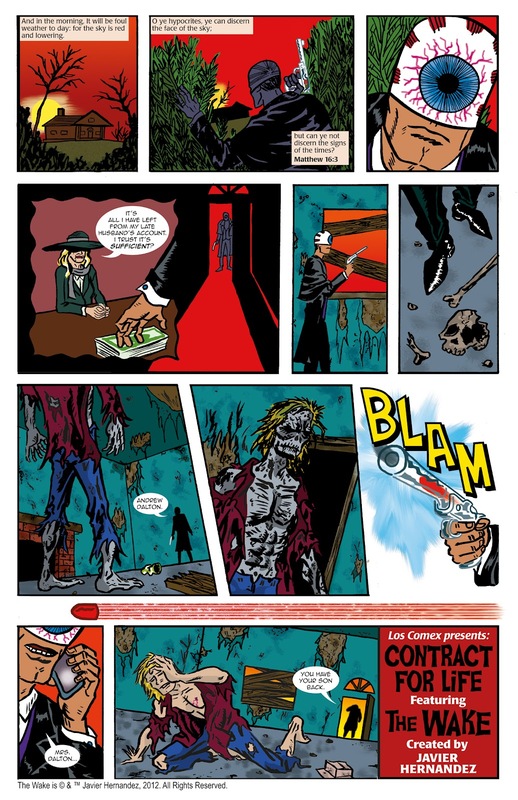 What strange forces bring together the Aztec Zombie and the Toro Terminator in the haunted ghost town of Santa Sangre? 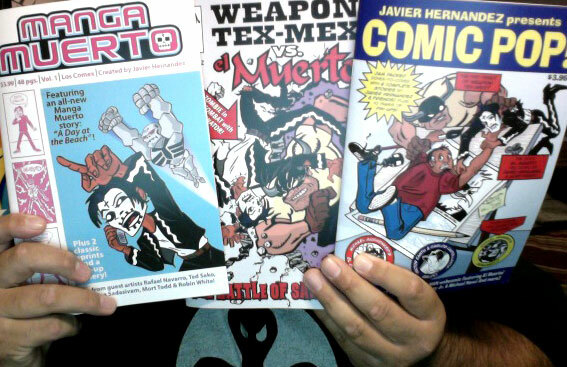 Also featured in the WEAPON TEX-MEX Vs EL MUERTO book are two other Tex-Mex short stories, and that ain't no bull! Shop the JAVZILLA WebShop today. You'll get some exciting books packed with a variety of comic book stories, and you're supporting creator-owned work, the most exciting work being produced in comics today! The character of The Wake is an idea I just came up with in time for this comic. You can read this previous Blog post for some early design sketches. To see a much larger sized copy of the comic (which is much more readable) click this link to visit my DeviantArt page, then click on that image to super size it. 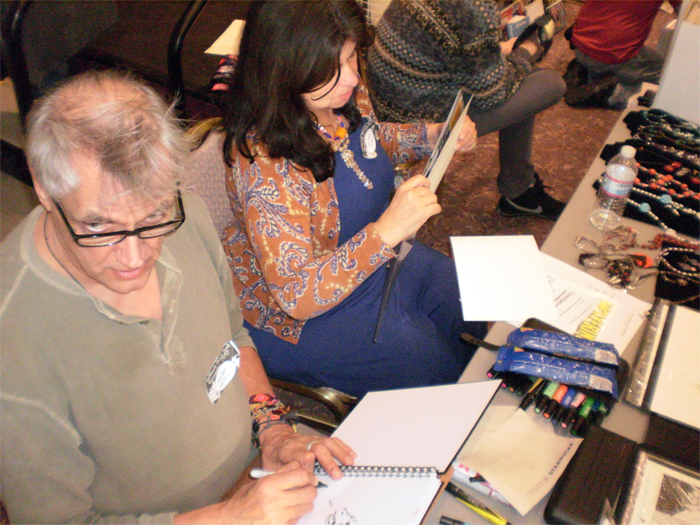 Thanks to my friend and fellow cartoonist Ted Seko for some keen advice. I showed Ted my layout for the page and he offered some suggestions that really improved the storytelling of the comic. It really helps to have someone whose skills you admire and trust take a look at a project in the development stage. Now if we ever make a Wake movie, I'll have to get Ted tickets for Opening Night! Little behind in blogging about this, but on Sunday, January 29, I visited the California Comic Convention in Yorba Linda, CA. A retailer friend of mine has been telling me about this show for the last couple of years, but I never made it out there. When I found out who the special guests were for this time around, I knew I had to make it. 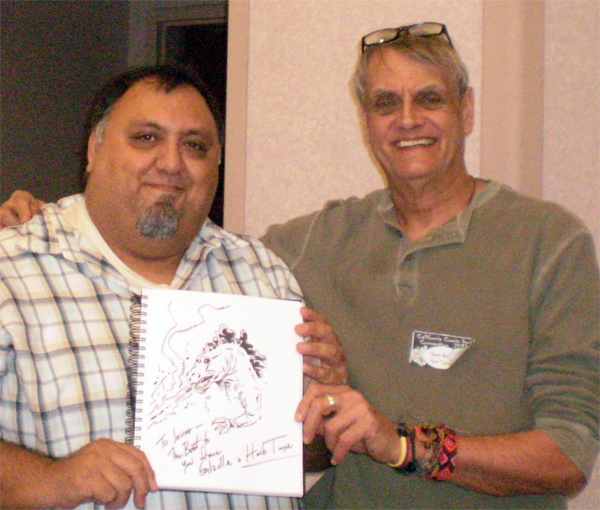 Comic book artists Herb Trimpe and Val Mayerik were attending, and I had never met either one before. 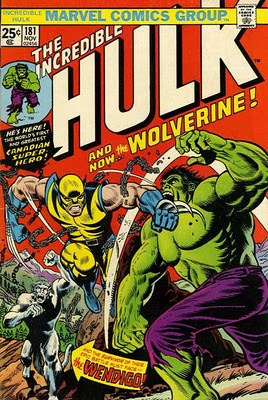 Herb Trimpe was one of the most prolific comic artists whose work I was exposed to during my most formative years as a young reader, from the mid-70s until the mid-80s. 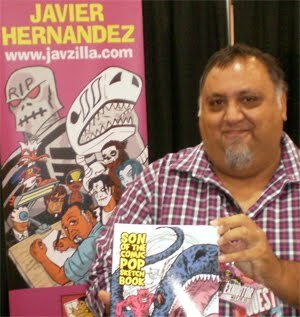 His long run on THE HULK was a huge favorite, as well as his work on various Marvel titles that were licensed from other properties, namely GODZILLA, THE SHOGUN WARRIORS and G.I. JOE, to name a few. 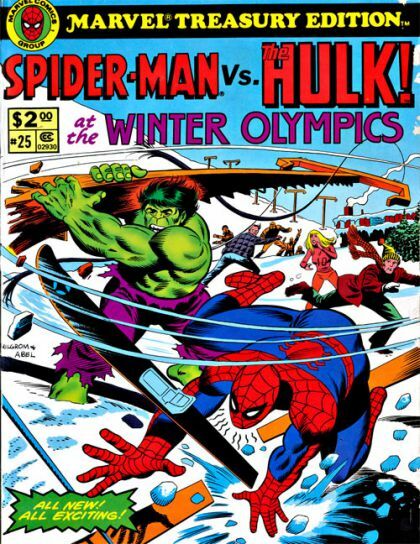 But the book I had wanted him to sign was my original 1980 copy of SPIDER-MAN Vs THE HULK AT THE WINTER OLYMPICS! This was a Treasury Size comic book, 10" x 13", that to my young eyes back in the day was a whopper of a slugfest. It was cool seeing Trimpe thumb through the book, as he mentioned that he enjoyed seeing his work printed in that large format. Herb was also accepting commissions, so I decided on asking him for a Godzilla sketch. His wife, by the way, was a delight to talk to, and I'm sure over the years she's learned to be patient with Herb's many fans! What I've always liked about Herb's version of Godzilla was that it wasn't an exact recreation of the design from the Toho movies. He said he had no editorial direction from Marvel or Toho regarding the design, and he just came up with a look that he felt worked. Another example of that care-free, loose style that made comics great growing up. Let an artist bring his own ideas to the plate, without a bunch of suits telling him how to do it. 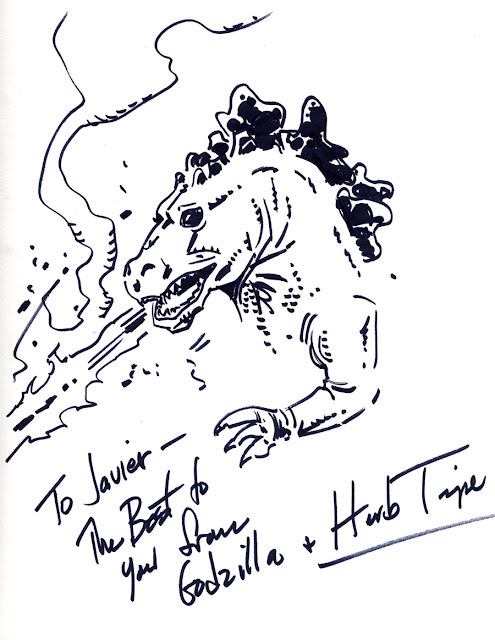 I've been very fortunate over the years to have been able to meet many of my childhood favorites, and meeting Herb Trimpe was in no way a disappointment. He was very engaging and thoughtful, talking about a variety of topics the whole time. I even had the nerve to show him the rough draft of a one-page comic I was working on. He looked through the sheet, following along from panel to panel. He complimented me on the clarity of the storytelling, and even asked if I had the finished page (which I didn't!). As a creator myself, and one who really enjoys meeting the people who buy my work, I always think about the older artists I've met and how well they treat their fans. I've always tried to make each person who visits me feel welcome and appreciated, so I have guys like Herb to thank for setting the example. My friend Ted Seko, who I traveled with to the convention, counts Herb Trimpe among his top favorite comic book artists. 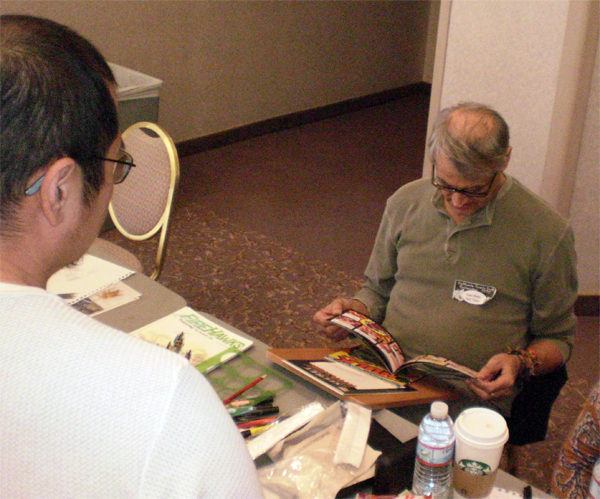 Ted gave Herb a copy of his recent book, SUPER MONSTERAMA, and Herb was very complimentary toward the artwork, taking his time looking through the book. I felt really happy for Ted, as I know he was on cloud nine to hear that from Mr. Trimpe. The other artists in attendance at the show was Val Mayerik. Val worked with Steve Gerber on a variety of projects beginning in the 70s. Their most famous work has to be the creation of Howard the Duck, something long-time readers of this blog know I'm a big fan of. I asked Val about his working relationship to the late Steve Gerber, and I could tell that the admiration he had for his collaborator was sincere. 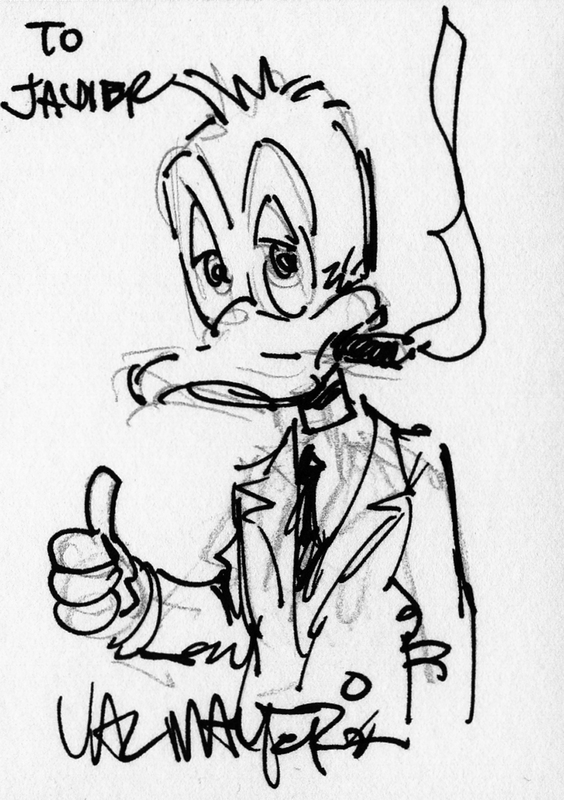 I got a small Howard the Duck drawing from Val on a sketchcard. Very pleasant person to talk to, so it's nice to have been able to meet him. Nowadays, I rarely go to a comic book convention if I'm not exhibiting at it. But this show was more of a comic collector's show, with pretty much the entire floor made up of back issue dealers, so it's not really something I would have a table at. Not one unemployed actor in sight! It was nice to be able to spend time looking through back issues of comics, and have some pleasant conversations with Herb and Val. Connecting with these old school artists reminds me why I loved comics so much as a kid, and why I eventually decided to create my own works.